At Pat's Body Work, we take great care when servicing you and your vehicle. We value your opinion and would love to hear your feedback on your job from Pat's Body Work. I asked Pat to repaint a new bumper cover for our 2005 Toyota Prius, and also the hood since it had many chips from road debris. I left the car with him while we went to Europe for 2 weeks. His estimate was reasonable. Pat did an outstanding job, better than I imagined the car could look. That's saying something since I usually get results lower in quality than I expect. He takes obvious pride in his work and is very friendly/easy to deal with. For those reasons, I would highly recommend Pat's Body Work. Thanks for giving our Prius a terrific paint job! Pat did an amazing job! in just two days he turned my smashed up truck and made it look brand new. I was absolutely amazed and still am. The lines are perfect I couldn't be more happy with it. Pat, you're very good at what you do man. Much thanks from me. And for anybody reading this please don't waste your time anywhere else, Pat is the most honest and reliable auto body repairman in Pinellas County, probably even the whole state. Hands down. This is a great Body Shop! - Very Ethical! Pat never cuts corners. He takes pride in every project and deals honestly and fairly with each client. I have been bringing my cars to him for years and wouldn't go anywhere else! You'll be in good hands with Pat! When my bumper flew up and destroyed my taillight and tire/rim, I didn't know what to do. I rely on my car for everything and it wasn't drivable! Luckily, I found Pat's Body Work! His body shop was only a few blocks from me and he made time to look at my car right away. He secured my bumper for a very reasonable price and got me back on the road right away! Honest and affordable auto care is not easy to find these days. So glad I found Pat's Body Work! Thanks, Pat! Pat is friendly, thorough, and fair. He's THE guy you want to know for auto body work IN St.Pete. Always responsive and fixed my car for the best price in town and without delay. I will refer all my friends and family to Pat. Pat is amazingly talented at what he does. He's fair priced and trustworthy. We had a huge dent in the tailgate of our minivan. Pat made it look like brand new without replacing the tailgate - which is what 5 other collision and dent repair specialists informed me that I needed to do. I also shopped around for the best estimate and Pat’s estimate beat them all. He even finished a day earlier than planned. If you need body work done, Pat is definitely the guy to go to. Pat is a very down to earth guy, reasonable and easy to deal with. 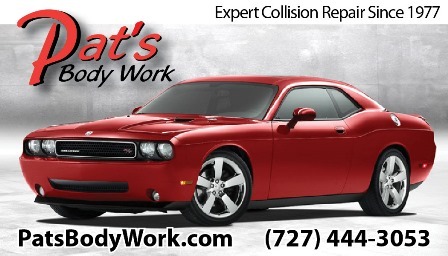 I rarely give a shout out to a business, but recently had auto body work done at Pat's Body Work in St. Pete. Amazing work and an honest price. I went to him based only on his Google reviews of 5 stars. They were true! If you need any auto body work. He's the guy. Pat did a great job on my Ford Explorer. He fixed the backend and blended the paint so you cannot tell it was in an accident. He was easy to deal with and got the job done quickly. I highly recommend his work.